Do you really believe in all the products you are offering your Guests? Or…are you compromising your credibility, right out of the gate, each time you make an initial menu presentation?? Does the column structure of your menu say, “sorry I asked you to consider those items, initially, but over here near the end, this is the meat and potatoes…these are the items that matter!”??? That’s exactly the message conveyed if you’re offering shallow product columns, anywhere in the body of your menu, at least for the first pass (before any objection handling has been warranted). As always, we created this structure with a two-term payment format. This is what the payments will look like if we have a Guest with good qualifications, 60 and 72 month terms on the table (always offered at the same rate for both, where possible…6%, in this case) and pricing as follows: Key Replacement = $495, ResistAll = $695, and GAP = $795. The result will be a 60 month payment for the car AS-IT-IS that is nearly the same as that for 72 months, with the car well and fully protected (in line with what you have available)! Once we’ve concluded our menu presentation, we’ll make our recommendation as to which column we feel is most applicable to our Guest’s needs. Since we absolutely believe in everything we have available, we’ll recommend the Preferred column for our Guest who needs GAP…and the Economy option for those who don’t. 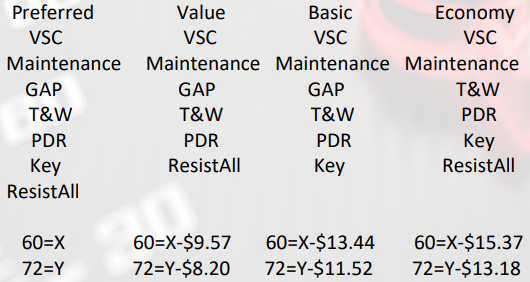 Consider this in contrast to offering, perhaps, your last column with just VSC and GAP, for example. Suddenly your 60 and 72 month payment options are $50-$60 per month less than that of your first column, your credibility may be compromised, a little, and your Guests have missed out on some great benefits! Additionally your PRU is suddenly several hundred less and your PPR is down, considerably. No bueno!!! It’s always nice to see a menu presentation which makes zero apologies, for asking that something had been considered, and Guests who are provided the opportunity to take advantage of that which we have available, via our valuable insight!